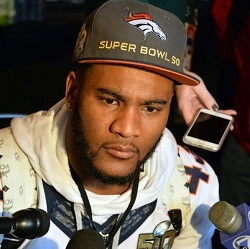 T.J. Ward, SS, Broncos (NFL): As much as the voters may have wanted to give Super Bowl 50 MVP to QB Peyton Manning, the Denver defense — most notably LB Von Miller — was too good to be denied. One also could’ve made a strong MVP case for Ward, the 6th-year pro out of Oregon who had seven tackles, an interception and a fumble recovery in the Broncos’ 24-10 victory over the Panthers. Ward, who didn’t have a single interception or fumble recovery during the regular season or playoffs before Sunday, picked off Carolina QB Cam Newton in the third quarter when the Panthers were just outside the red zone and trailing 16-7. Ward’s fourth-quarter fumble recovery set up the TD that was essentially the dagger for Denver. Darian Stewart, FS, Broncos (NFL): Before, during and after the game, the dominant Super Bowl stories revolved around opposing quarterbacks Manning and Newton. Overlooked and underappreciated as usual were the respective defenses, and one standout was Stewart, who is referred to as the quarterback of Denver’s defense. He had three tackles and one sack on Sunday and helped lead a phenomenal team defensive effort by the Broncos. Josh Norman, CB, Panthers (NFL): The enduring image of Norman from the Super Bowl will be of him crying on the field after Carolina’s loss became official. Before that, however, Norman played a quietly great game. Carolina’s lockdown corner helped limit Denver’s top receiver, Demaryius Thomas, to just one catch for eight yards and broke up two or three passes. Tony Dungy (NFL): On Saturday, Dungy was announced as part of the Pro Football Hall of Fame class of 2016 for his accomplishments as a coach. He guided the Indianapolis Colts to a victory in Super Bowl XLI and compiled a 148-79 record as a head coach. Dungy was also a standout player. He was an undrafted free agent quarterback out of the University of Minnesota who converted to safety in the pros and played on the Steelers’ Super Bowl XIII championship team. Dungy also played with the 49ers and Giants. Eric Berry, FS, Chiefs (NFL): Diagnosed with Hodgkin’s lymphoma in December 2014, Berry beat cancer and amazingly didn’t miss a beat on the field. He returned in time for the 2015 season, regained his starting job in Kansas City, then earned his second All-Pro first team and his fourth Pro Bowl selection thanks to 61 tackles and two interceptions. Berry also helped the Chiefs make the playoffs behind one of the league’s top defenses. For that, Berry was voted AP Comeback Player of the Year at the “NFL Honors” awards show on Saturday. Marcus Peters, CB, Chiefs (NFL): Tying for the NFL lead this season with eight interceptions to go along with 60 tackles, Peters became the first cornerback to win AP Defensive Rookie of the Year since Charles Woodson back in 1998. And in a nice piece of full-circle-ness, the retiring Woodson was also honored at Saturday’s awards show with the Art Rooney Award for sportsmanship.